1. What is Nippon Momento? 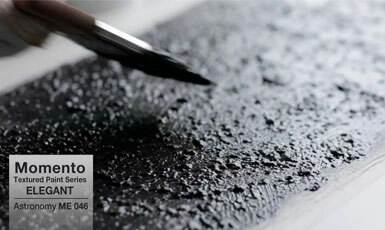 Nippon Momento® is a contemporary and unorthodox approach to traditional paint. It comes in six different textures to satisfy every homeowner. 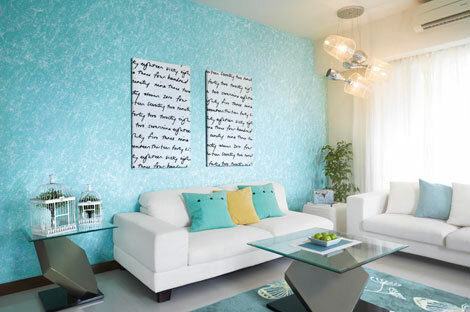 Nippon Momento® allows you to add rich textures to your wall or enhance existing wall colours. 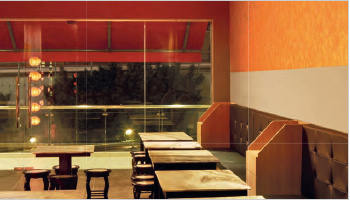 A unique paint that creates specially textured walls with an opaque wall finish, featuring four unique special effects. A matt textured finish, with rustic colours of rich vibrancy. A textured finish of luminous colours with a pearlescent glow. A textured semi-metallic finish with shimmering colours bathed in silver light. A textured semi-metallic finish with majestic colour dusted in a gold shine. 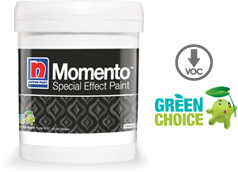 A special line of semi-transparent paint that enhances any existing wall colour with a semi-transparent glaze-over, featuring two unique special effects. A unique texture that brings winder mornings touched with snow, pearl or gold. A special finish of sophisticated semi-transparent colours with a tinge of pearl or gold. 2. What is Nippon Momento® made of? Is it an environmentally friendly product? A low volatile organic compound (VOC), free from harmful chemicals – such as lead, mercury, chrome and heavy metals. 3. Where can I paint Nippon Momento®? 4. How long will a Nippon Momento® wall last? It will last for as long as you want until you decide to repaint or remove it. 5. 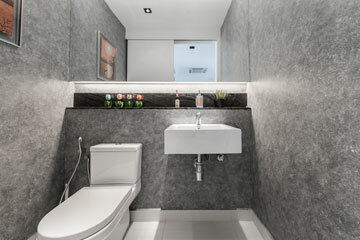 Can I paint Nippon Momento® in areas like the bathroom and/or kitchen? Yes you can. Just apply 1 layer of Nippon Momento® Clear Coat to protect your Nippon Momento® walls, if you do. 6. How do I paint Nippon Momento® on surfaces such as laminate/wood/tiles? Is there a specific method for each surface? On Tiles: In order to paint on tiles, apply 1 coat of the Nippon Hycote 51WT first and then followed by the same method you would paint Momento® on your walls. 7. How do I clean a Nippon Momento® wall? Use a damp cloth and gently dab on stained areas. Do not apply force when cleaning surfaces of textured finish. 8. What would I have to do if I wanted to repaint an existing Nippon Momento® wall with a different finish? Repaint the wall with a new variant. Sand wall with sandpaper to smoothen the surface. Apply 1 coat of any Nippon wall sealer range. 9. What would I have to do if I wanted to repaint an existing Nippon Momento® wall without any finishes? Sand on the previously painted Nippon Momento® surface lightly. Then, apply 2 coats of Nippon premium paint range after. 10. How much does it cost to paint Nippon Momento® ? For more information regarding Nippon Momento pricing, please call our hotline at 6265 5355 during our working hours. 11. How much of a wall area does Nippon Momento® cover per litre, per coat? 12. 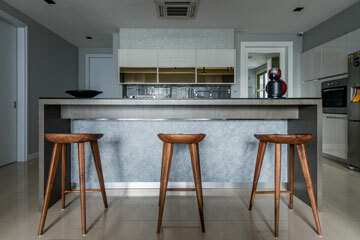 How do I apply Nippon Momento® to interior walls? Paint 2 coats of Nippon Momento® Primer onto existing wall. Paint 1 coat of any Nippon Momento® topcoat variant of your choice (Elegant, Sparkle Pearl, Sparkle Silver or Sparkle Gold). Use the spatula to gently smooth over the painted surface after 10 – 15 minutes, when it is semi-dry. Paint 1 coat of Cloud/Frost onto existing wall. Paint 1 coat of any Nippon wall sealer range. Apply 2 coats of Nippon premium paint range. 13. 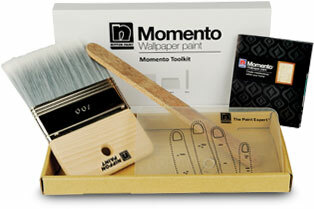 Can I use other painting brush apart from the Nippon Momento® 3" brush that comes with the toolkit? Using the 3″ brush that comes with the toolkit is highly recommended as the bristles are specially designed to be neither too hard nor too soft. 14. How do I clean a Nippon Momento® 3" brush? Rinse it under running water immediately after use. 15. What surface preparation will I have to do before I start painting? Remove all dirt, dust, and grease from the surface. Be sure to remove any dust or cobwebs. Don’t forget when painting the kitchen and bathrooms, check around corners, air vents, ceilings, shower stall, sink, switch plates, etc. 16. What should I do when I start painting a wall with Nippon Momento®? Mask off areas that will not be painted with a masking tape to avoid making a mess. Start painting from the corners to ensure a smooth painting process. Dip the brush and sweep it along the edges and corners. Start moving the brush out and using irregular criss-cross strokes. Work the paint in one direction (E.g: L to R or R to L) in a top-to-bottom approach. 17. How do I get the best possible colour consistency? Use the same batch of paint for each job or structure. Be sure to be consistent in the amount of paint applied. 18. Are there any other useful tips or tricks for painting Nippon Momento®? To prevent joint lines, keep a wet edge to avoid paint from drying out. Don’t stop painting in the middle of a continuous wall or trim surface. Do not stop painting until the whole wall is completed. If you do, paint will dry and colour will intensify and darken causing joint lines. 19. I just painted my walls with Nippon Momento® and noticed that there are visible lines on the surface? What do I do? Dilute the paint with some water, go over the lap marks and smudge the intensified area using a circular motion or criss-cross strokes. Use the leftover paint available or get a new tub of the same variant. Then, add paint onto areas A, B, C and D that are now lighter than the lap marks to make it even again. Note: Red line in diagram reflects joint lines.